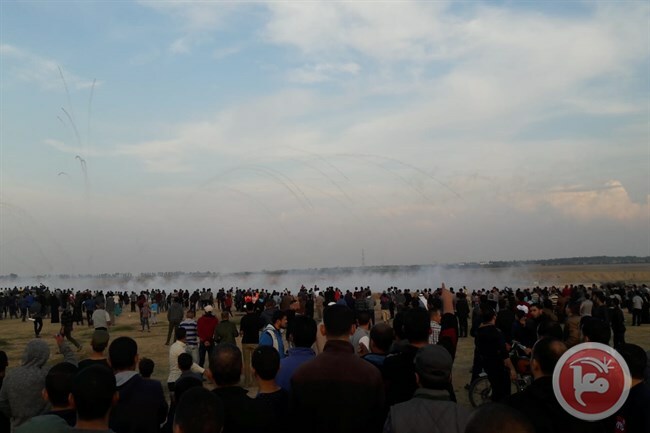 GAZA CITY (Ma’an) — Injuries were reported among Palestinians protesting at the eastern borders of the besieged Gaza Strip, on Friday afternoon. Medical sources told Ma’an that the paramedic, Filastin Qudeih, whose first name means Palestine, was injured with a live bullet in her leg. According to the Palestinian Ministry of Health in Gaza, 220 Palestinians have been killed since the beginning of “The Great March of Return” on March 30th, while more than 24,000 others have been injured. “The Great March of Return” protests were launched on by thousands of Palestinian civilians in Gaza — which has suffered from a decade-long Israeli siege — who took to the borders to demand their right of return as refugees to their original homelands, now in present-day Israel.